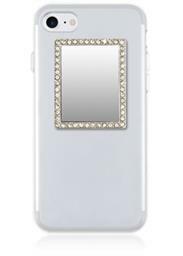 SILVER WITH CLEAR CRYSTALS RECTANGLE SELFIE MIRROR. (PRICE IS FOR MIRROR ONLY PHONE NOT INCLUDED). The best way to check yourself out on-the-go touch-up your makeup check your teeth and take the perfect selfie!